With spring on the doorstep, I feel it’s my duty as a natural nutritionist to help guide you towards light and refreshing lunch options when dining out! Spring screams freshness and for some it’s a time to unzip the hibernation suit and eat in line with the warmer weather. 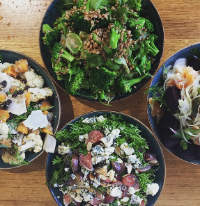 Look no further than the below for some Brisbane salad haunts which will be sure to put a spring in your step! Daily changing salads certain to please all manner of tastebuds! A Brisbane dietary nutritionists delight. The name says it all, daily delicious selection of salads to take-away. I like to order a box and combine with a protein source back home eg boiled eggs, baked salmon or roast chicken. My favourite salad in Brisbane: Asian chicken salad, coriander, mint, peanuts, coconut and tamarind – never taken off the menu for a highly flavoursome reason! Poached chicken + quinoa salad with red rice, rocket, diced sweet potato, orange, almond, goji berry, lime + honey, a nice one to share as part of a grazing meal. Sol offers a selection of salads and numerous gluten-free options, including pizza! Seasonal menu with a forever-reliable salad option! Their grilled lamb Greek salad is second to none. Whilst boasting a coal-fired spit and thus famous for meat, their salad options do not disappoint. If you’re a fan of smokey flavours be sure to try their hot smoked salmon salad! A daily changing salad selection positively certain to entice all tastebuds! Each season a refreshing, and light modern Asian influenced salad thankfully always make a menu appearance! They may title their menu ‘salad to share’ but I guarantee the last thing you will want to do is share. Their salads are best described as fresh, flavoursome and moreish! What more could you want to celebrate spring?